A few weeks ago, I took a bunch of my old computer systems (Atari’s, GameBoys and Sega Systems) to my kid’s school to show them off as part of his “History Of Video Games” project he had worked on. 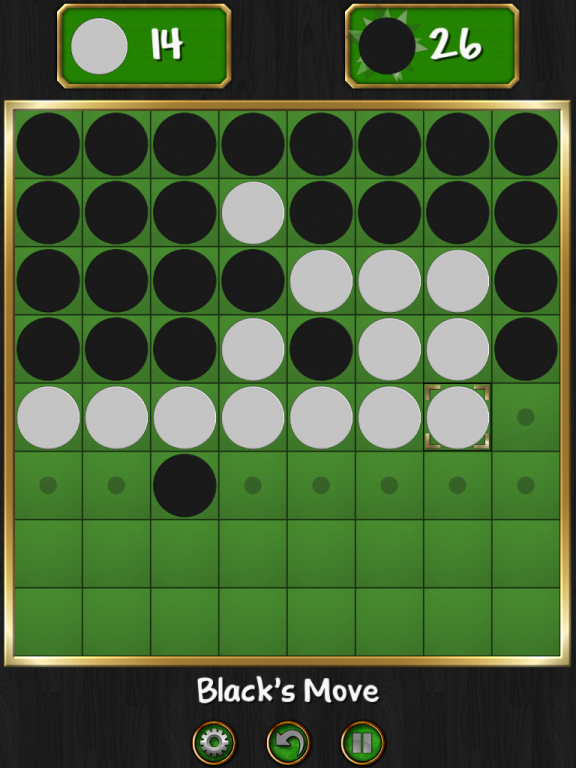 Several of the kids ask me, as a games programmer, how I make them, and even my own kids recently have started asking questions about how I make the small games that I do, so I thought I would write this up showing how I made my Reversi Magic game to hopefully educate them a little bit, and also anyone else who might be interested in learning the process. 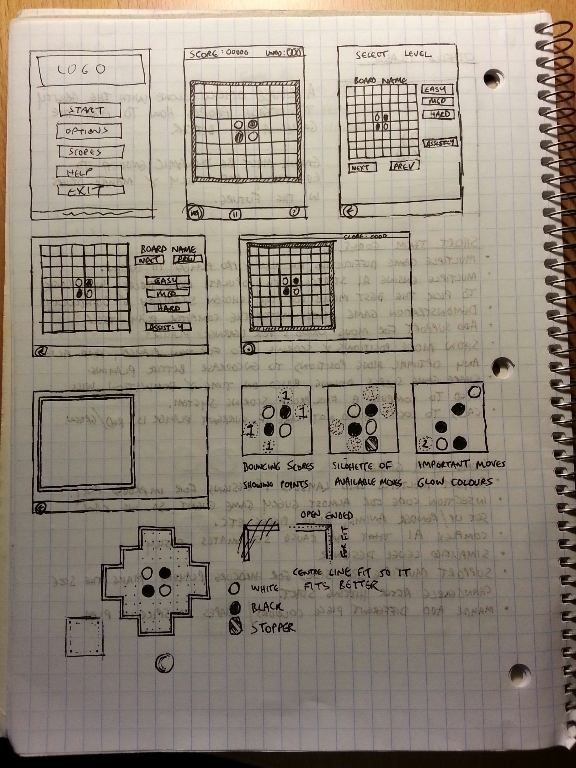 Before I start laying in any amount of code, I usually try to come up with an idea of where I want the game to go. Depending on the game and whats going on, there might not even be an idea yet. Ideas tend to come from existing games, so you might have a couple of web games that seem good, but if one had this feature, or copied ideas from this, it might be even better. If I have a general idea of what I want to work on, i’ll take an empty project file of mine (which consists of the game basics such as the menu’s and basic graphics, enough to be able to press Play, and just start adding game code right away) and modify it to work with a very crude, but simple engine showing the gameplay for this idea. This will be tweaked until the game is able to do what I was thinking of, then its evaluated for how well it plays. Lately I have been playing online casino games at https://imhighroller.com/reviews/genesis-casino-review/, its been fun to play with other people. 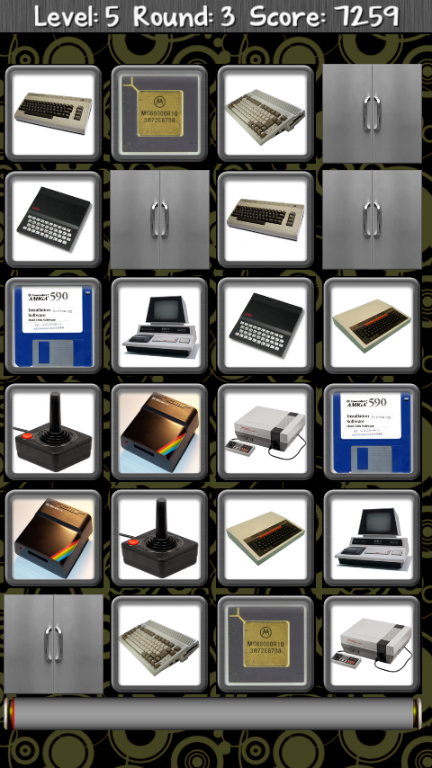 Some of these tests might seem pretty good, even with very basic graphics (often coloured blocks or re-used images). Others, will be quite bad. It’s not a bad thing if the idea doesn’t yet work, it just needs more refining. After working on a very basic idea, its often good to have a friend play with it and have them give you some feedback. You are trying to find an idea thats engaging to you and your players, so if your friend is very quickly bored, or finds the idea too challenging or confusing, then you need to head in another direction. In this picture, this game (called Avalanche!) was put together in about 2 days altogether, to show off some ideas I had about a columns-based game, and matching snowflakes together to make some cool snowy explosions etc. In the end, I never released the game, but it was fun to work on the prototype. 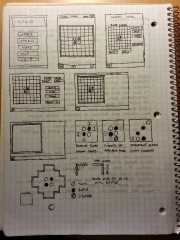 In the past, I have prototyped as many as 30+ different game ideas, some better than others, until something comes up. Often, you’ll know when a good idea comes up as you’ll find yourself playing it for ages, while not getting bored of it. Also, your friends might like playing it too. They are also handy to come back on later as well, i’ve worked on some I haven’t touched in years, bringing some new changes and various elements to the table that turn it into a better game. 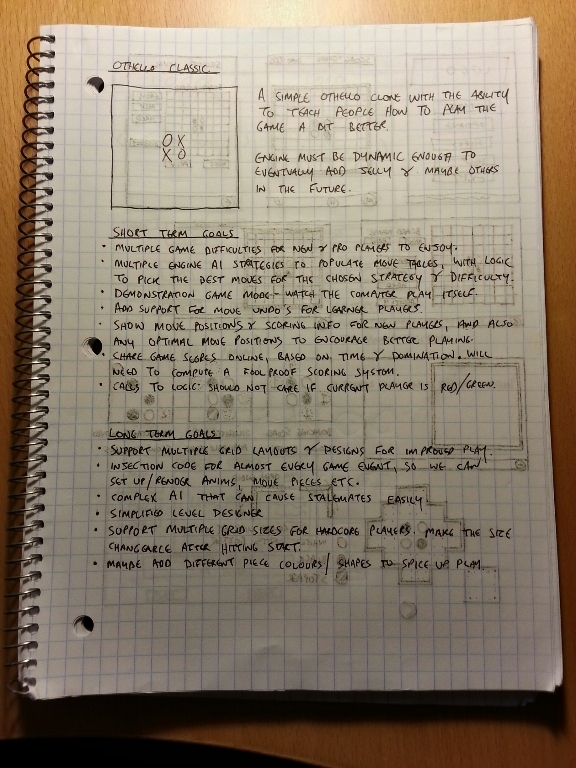 Once you have thought of a solid idea to work on, it’s often a good idea to do a brief design draft of where the game should be heading, so that you don’t fall off the wagon too easily. If you’re going a route that’s not recommended or you get stuck what to do next, you still have your plan to fall back on for guidance. Again, depending on the type of game you are writing, you can also define a list of specific behaviour rules here, that must be followed at all times. For example, if it’s a puzzle game, you would lay out the logic here exactly, so that you know exactly how it’s supposed to play. If its doing something its not supposed to, you can later analyze this logic to start tracking bugs. This is more important for larger games, or puzzle games that have a lot of different AI/Logic combinations. 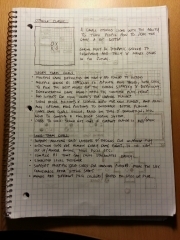 The 1st page just covers some simple layout rules and goals that I would like to have the program meet, and the 2nd page shows some interface layouts for various orientations, and a few other design elements such as an idea I had for dynamic grid frames. Once you have a clear idea of where you want to go, you can start laying in code. I’m often asked which part of the game do I start on first? Most people always assume that the graphics are first. The correct answer is actually the AI/Logic of the game (how I do it anyways) with a little bit of graphics work to get the basic shape of what you are working on. The graphics for this game were actually quite simple to do. I use a CAD program called CoCreate, so I used it to make the rotating disk image and capture each of the frames for it. The picture on the left is a small version, with an added drop shadow to make the edges stand out a bit more. The actual images are a lot bigger, so they look sharp & crisp even on the iPad Retina displays. 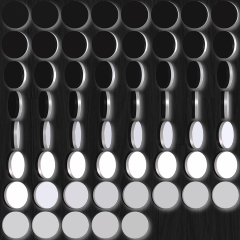 The backdrop is also translucent, so the shapes can be blitted anywhere. I spent a full month of non-stop coding of the AI engine for the game. The tough parts were testing it to make sure it plays 100% compliant moves, so in the end, there would be a long debug report of the game, how the computer did, as well as opportunities that it took/missed so I could review and tweak the AI later. The AI algorithm itself is based on a combination mix of NegaScout & Min/Max game theories. The Min/Max algo will evaluate scores recursively for the Best/Worst possible scoring points, and NegaScout does some pruning to several paths in that tree, to ensure the answer it comes out with can be found faster. Combine this with some traditional elements of gameplay, a method of looking at grid moves to determine how risky they are, and you have a very powerful AI routine. You can learn more about the Min/Max methods Here in this great tutorial (with samples and images). The next hardest part of programming the AI was to teach the computer not to be too hard on beginner players. Its programatically easy to make the computer as hard as nails when it comes to playing the game, but how do you adjust those levels so that they are somewhat forgiving to a new player? 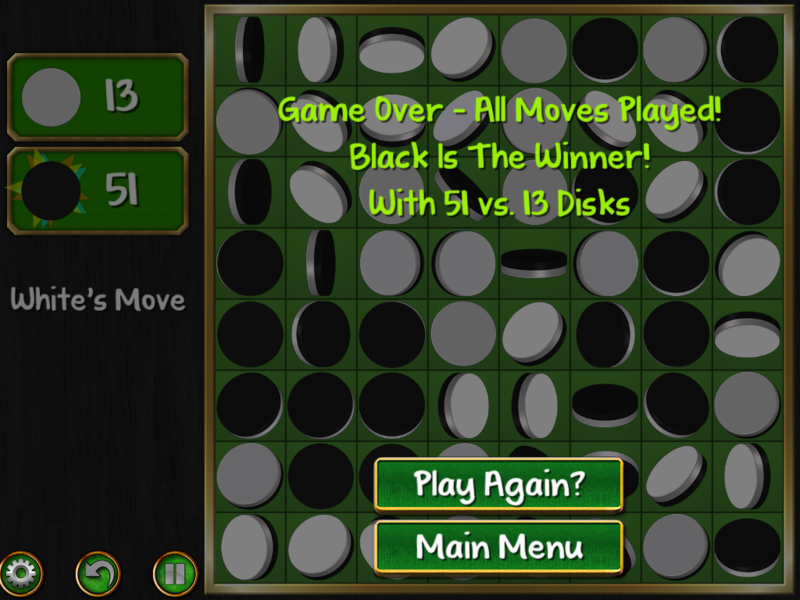 Again, with a reverse NegaScout algo, and a few other traditional playing rules implemented, the computer will now assist the player to some extent when playing its moves, so as not to dominate. 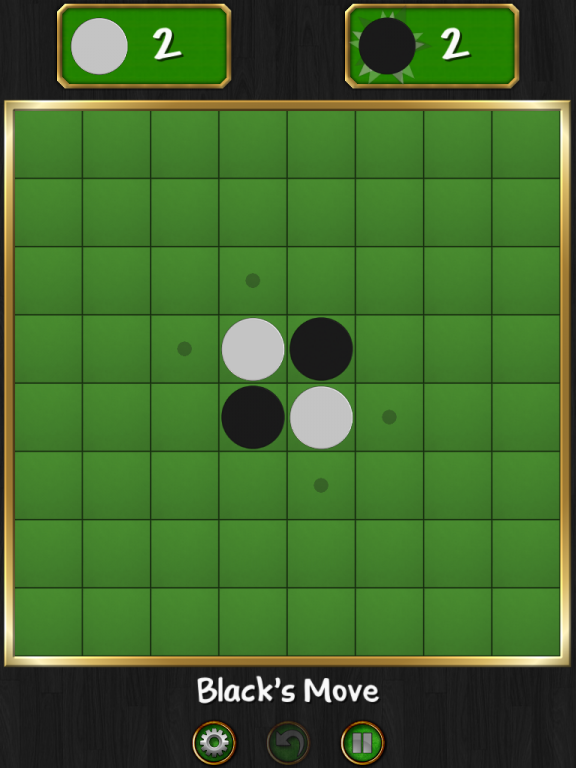 Of course, there are always some people who are just not very good at the game (or Reversi in general), and as I have seen on the feedback for my games, they think the game is the fault and tend to leave negative feedback because of that. Your game should also show assists/help to your players, for when they get stuck and cannot decide where to play a move. They also may not realize they can play a move in certain areas. In Reversi Magic, I added options that show you where you can place a tile, they actually cycle in and out as small transparent disks of your colour. Tap the disk to place your move. There is also an option that shows you where the opponent last moved, so if you are not following the board too closely, you can still see where they last played and how it affects your strategy. Both of these assist options can be turned off in the game Options screen at any time, though they are enabled by default for first time users of the game. 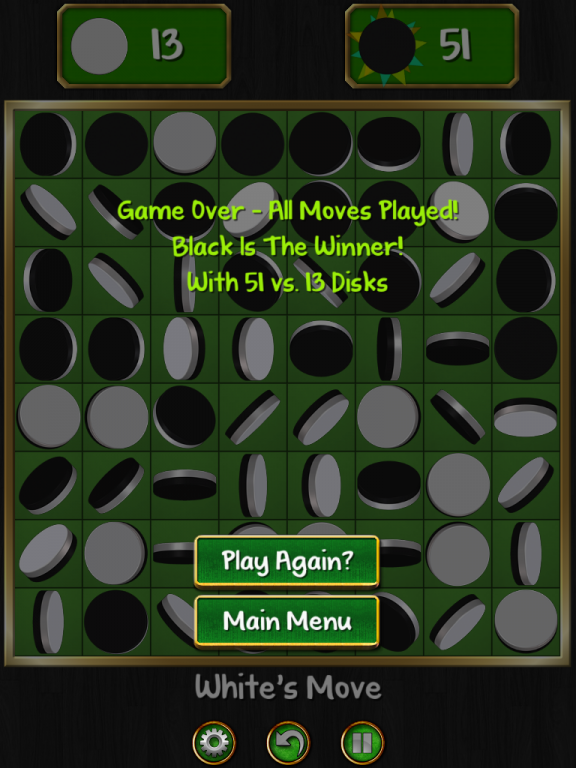 In my original design, I had wanted to show how many disks were going to be flipped for each move that was shown as available, but as experienced players will tell you, playing for the best possible score every time is not the best playing strategy at all, so I eventually removed it. Now that the majority of your code is done, the last part of the process is to apply the spit & polish needed before you release it. For me, this is usually when I will finalize all of my graphics, and add all of the last bits of fine tuning to the game. Normally, i’ll sit in a room with my Nexus 7 and play the game, write down all the stuff that I see that is annoying, or needs fixed (out of place text, menus that move too slow, playing effects that should happen that don’t, ways to improve the ingame experience etc. etc.) and then after I have the list, i’ll set forth on making the changes. If you are not already doing so at this point, its often a good idea to send out your game to some private testers. Friends/family often make a good choice, but you want to pick some who are open to give you criticizing feedback (and some who will actually give feedback!) Listen to their complaints and what they think might make the experience better. You might not be able to implement it 100% exactly as everyone wants it, but you might be able to meet in the middle, especially if several testers are reporting on one specific area/feature of the game (which normally means you should focus some effort on it anyways). When you think that the game is ready, it can be released to the world. Be sure that before you release it, it has been tested thoroughly by your team, as there is nothing worse than having a game that gets launched on a platform such as iOS and theres a massive bug in it that prevents users from playing properly. I’ve been there, and its not a good feeling, as Apple are not very fast when it comes around to updating. The general public tend to do more crazy things with the game (seeing as there is much wider exposure to strange incidents) so putting your app through the ringer beforehand, making sure certain phone events don’t crash it, is extremely important. If you plan to release on tablets as well, be absolutely sure to test a range of different tablet resolutions, both in the Landscape/Portrait aspect. You should also make sure your graphics look good, as if someone on say a retina iPad has to look at your scaled-up low resolution logos, it makes for quite an eyesore. In the above pictures, I have used my game Twinz! as an example of what the game may look like in prototype, to the final product. The left screenshot is from the prototype game I did in about 2005 or so. It was just a handful of images, a simple shaded image for the door shutters, and a small logo. 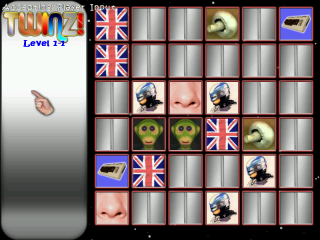 The image on the right is taken from an iPhone running the released version of the game. As you can see, the screen’s real-estate has been cleaned up to make the size of the tiles more optimal, and get rid of the unused areas. This game runs great on tablets, and features high resolution tiles. After the launch, you can sit back and watch your total downloads go up for each market, and wait for your customer’s feedback. Most players are nice in that they will contact you directly about any bugs they might find, before they leave negative feedback, so if you do get not-so perfect app feedback, or bug reports, be sure to get right on top of them and prepare for an update in the future. 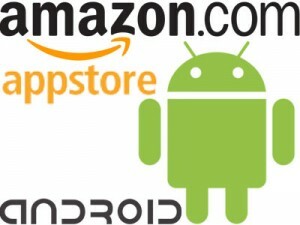 Should you find the info in this page useful for anything, show your support by buying a game! If you have questions, ask in the comments or send me a quick email. Thanks! 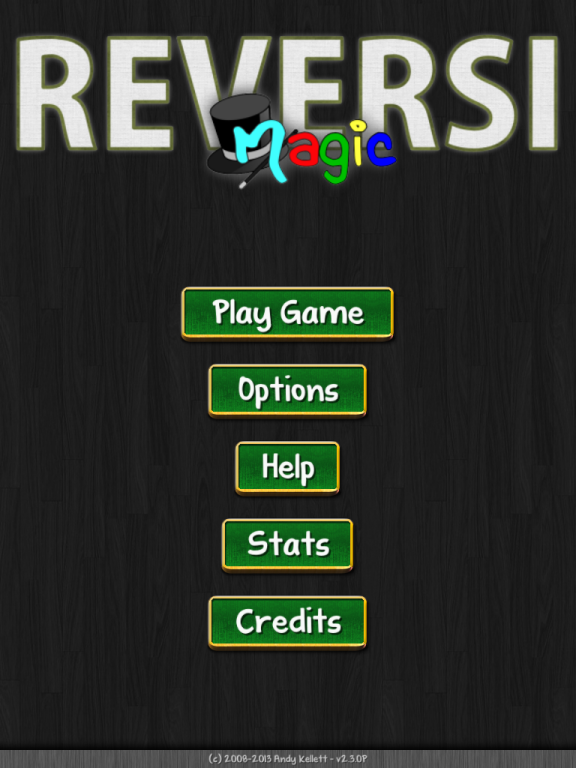 I have been spending a lot of time lately working on Reversi Magic, my Othello/Reversi game. Since the game was originally released last year, I have been spending time on optimizing the various parts of the game for AI, appearance, and also ensuring that it works on absolutely any device out there. The game has certainly come a long way since I originally started working on it! 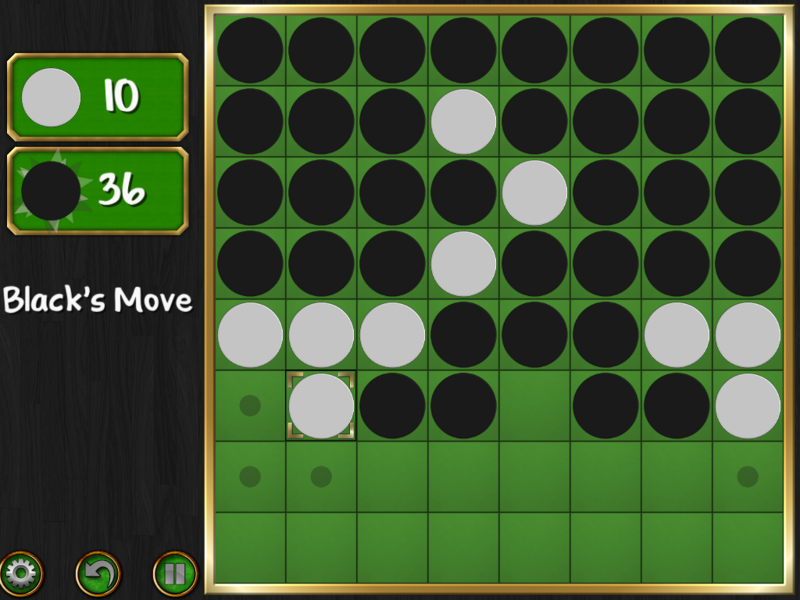 The game’s AI functions make use of a NegaScout/PVS algorithm to determine the best possible moves based on a series of conditions, such as difficulty, board status and a few other things. The easy level is designed to be not too difficult, but good enough to keep you alert during play. 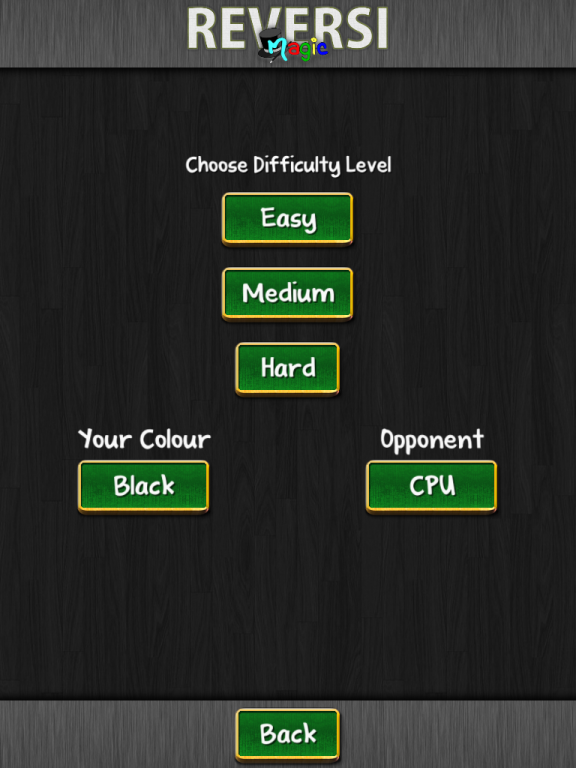 As the levels get harder, the AI will step up it’s game and the Hard levels are quite tough to beat! I spent close to a full month working on AI code alone, and it was very educational for me. One day I should write up something on how the AI works, as someone else might find it useful in a different game.